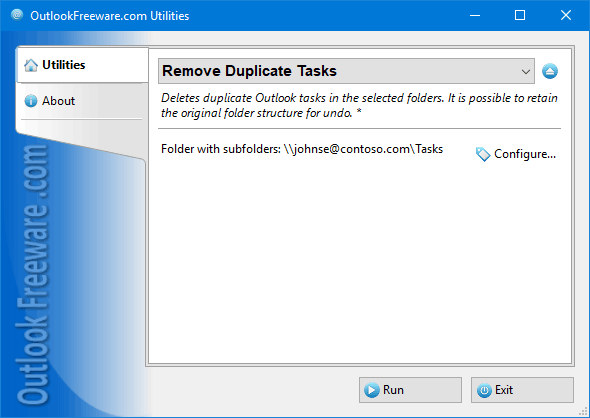 Free and easy way to move, remove or delete duplicate tasks in Outlook folders. The whole operation is completely safe, because you can always reverse the removal action. Advanced version allows you to select fields to compare, finds duplicates across different folders and storages and supports the priority of Outlook folders. For your convenience Outlook add-in allowing to run the tool right from Outlook and standalone launcher application allowing to run the tool without the need to run Outlook are included in the product. The utility repairs damaged files with dbx extension and it does not matter why these documents were corrupted. Recovery Toolbox for Outlook Express recovers even deleted messages that were removed from your PC by mistake and retrieves the data. The utility repairs forgotten or lost account details for Microsoft Outlook email client. Try Recovery Toolbox for Outlook Password, if you cannot remember your password for personal or corporate email account, it can be easily fixed with this tool. The ultimate utility to maintain your Thunderbird's local folders. You can use Thunderbird Fix It to recover deleted messages, remove duplicate messages, backup local folders, compact folders and remove attachments of your stored emails. The utility for Microsoft Outlook recovery opens damaged files of ost and pst format that are not currently accessible by this email client. Besides, it may convert ost files into pst documents offline, without the physical connection to mail server. We provide a powerful Gmail to PST conversion tool work as a Gmail backup tool which is the procedure that helpful to make a backup of Gmail email and convert Gmail to PST file format as well as EML file format. Bulk Email Solution gives you the easy and professional approach to create and send newsletters, ad messages, coupons and other contents to your clients, customers, subscribers and any other people who may be concerned. It's absolutely easy and safe. This free report shows user permissions for Outlook/Exchange folders. It provides a complete set of permission data for users in a table form. You can simply show user permission levels or turn on detailed mode to show the full set of permissions. Free tool to find unused contacts and mark them with categories or a flag. Leave only the contacts you're using in your work then filter, delete, or move them to another folder. Having fewer contacts saves your time. This free tool finds duplicate Outlook contacts and mark them with a flag or categories. Instead of manually comparing similar contacts, do this job quickly and automatically.